Yes, but only if you really do want to give up smoking. Honestly, if you’re not prepared to give up on a conscious level, that’s what you’re telling your subconscious, making it very difficult for you to give up. And it doesn’t matter what a hypnotherapist says to you, to your subconscious mind, you won’t stop smoking if you’re not prepared or willing to do so on a conscious level. So first of all that’s the question you need to ask yourself… “do I really want to quit smoking?” If the answer is yes, you really want to, you want to do this for the good of your health, to stop smelling of smoke, to stop affecting those closest to you and to live a healthier life in general, you have the desire and willingness to do so, then hypnosis can help. Instead of reaching for over the counter medications that can come with many side effects, hypnosis deals with and gets right to the subconscious mind where any patterns/habits around smoking are addressed, something the drugs aren’t designed to do. 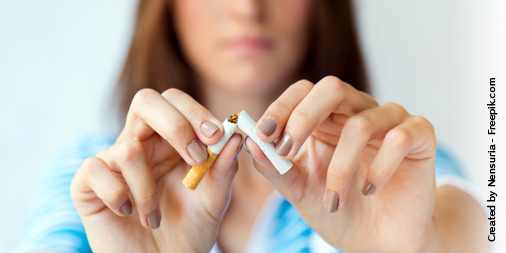 Some people, if they’re in the right mindset, are able to stop after just one hypnosis session, others need more, where a plan to cut down and eventually stop smoking is put in place. Either way, it’s worth trying for the sake of your health and those closest to you… and think of the money you’ll be saving in the long run. Click here to set up your complimentary meeting. ← NEW YEAR | NEW YOU | NEW LIFESTYLE!